Police clashed with hundreds of hooded anti-gay extremist in Montenegro on Wednesday as they tried to disrupt the first gay pride parade to be held in the conservative Balkan country that is in talks to join the European Union. Several hundred extremists shouting “Kill the gays” attacked gay activists and clashed with police on Wednesday in a bid to disrupt the first ever pride event in staunchly conservative Montenegro, which is seeking to improve its human rights record as it bids to join the European Union. 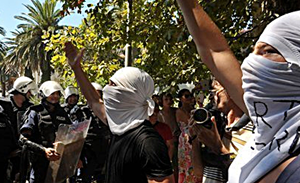 Angry assailants threw rocks, bottles, glasses and various other objects — including chairs from local cafes — at several dozen flag-waving gay activists who shouted back “Kiss the gays.” A shower of stones and bottles also landed on special police securing the gathering in the coastal town of Budva. Montenegro, began EU accession talks last year, hoping to be the next in line for membership after Croatia but before joining, it must demonstrate readiness to protect human rights. Doesn’t sound like the police were too enthusiastic in their support/protection.EU take note.